I'm a big fan of both LG (I love my LG G3!) and Barangay Ginebra (My whole family has been rooting Ginebra since the Jaworski days!) so I'm really looking forward to seeing this game. Filipino and South Korean cagers had been pitted against each other in international basketball tournaments, especially in the FIBA (International Basketball Federation) Asian Championships, where Korea thwarted the bid of the Filipino contingent to enter the World Cup several times. That is, until last year when the Philippines demolished the Korean squad and secured the country’s spot in the FIBA World Championship this August. To celebrate this arch rivalry between the two countries, LG Electronics presents a first of its kind basketball game in the Philippines dubbed the Asian Basketball Showdown. In this historic event, LG will be bringing to the Philippines one of South Korea’s top basketball teams, the Changwon LG Sakers, to have a basketball match with the Philippine Basketball Association (PBA) cagers Barangay Ginebra San Miguel. 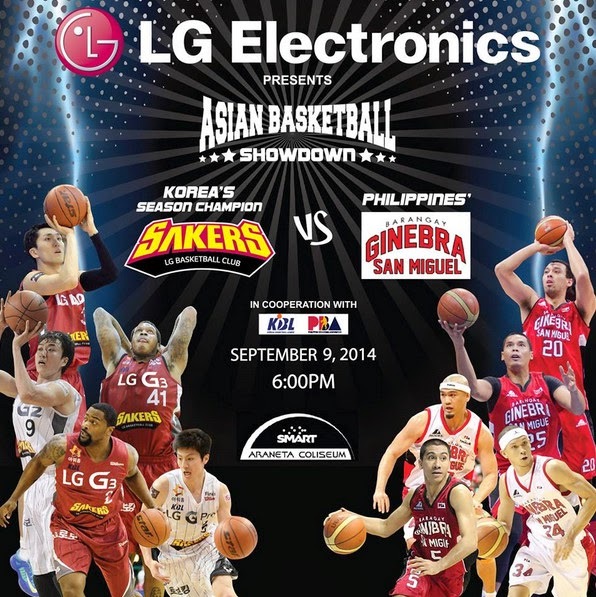 The Asian Basketball Showdown is slated on September 9, 2014, Tuesday, 6:00 PM at the Smart Araneta Coliseum in Quezon City. The Philippines is a full-blooded basketball country, as such, LG is opening the event to interested individuals all for free. To get two (2) free tickets, simply register via the registration app in facebook.com/LGPhilippines or go to bit.ly/lgsakers. Customers who buy any LG products are entitled to two (2) premium seats at the Patron section. After the purchase, consumers must register via the same Facebook App. Attendees of the event will also get a chance to win the newest premium LG products including the simplest yet smartest LG G3, the young and pop LG G Pad -- your launch pad, and the sleek, always on Android Wear LG G Watch. For those who register via the Facebook app, claiming of tickets will be on September 9, 2014, 9:00 AM onwards at the LG Electronics booths located at the Red and Green gates of the Smart Araneta Coliseum. Those who avail of the free tickets must present the e-ticket and one valid ID, while the LG customers who register for Patron seats tickets must bring the sales invoice/official receipt of the product purchased, along with the e-ticket and one valid ID. If the registrant will be giving the tickets to another person, the ticket receiver should bring an authorization letter from the registrant, along with the above-mentioned documents. Registration period is from August 20 to September 9, 2014. Claiming of tickets is on a first-come, first-served basis. Tickets may vary depending on the availability of the seats.